Indian silver tinder tubes are relatively rare. They were used to hold a thick textile cord that served as a wick that was used to light muskets and canons. And this example is one of the finest we have seen. It comprises a long, silver tube decorated all over with Hindu gods such as Krishna, Sariswati, and Matsya (the fish avatar of Vishnu), along with birds and yali-type creatures, against a background of dense floral relief. 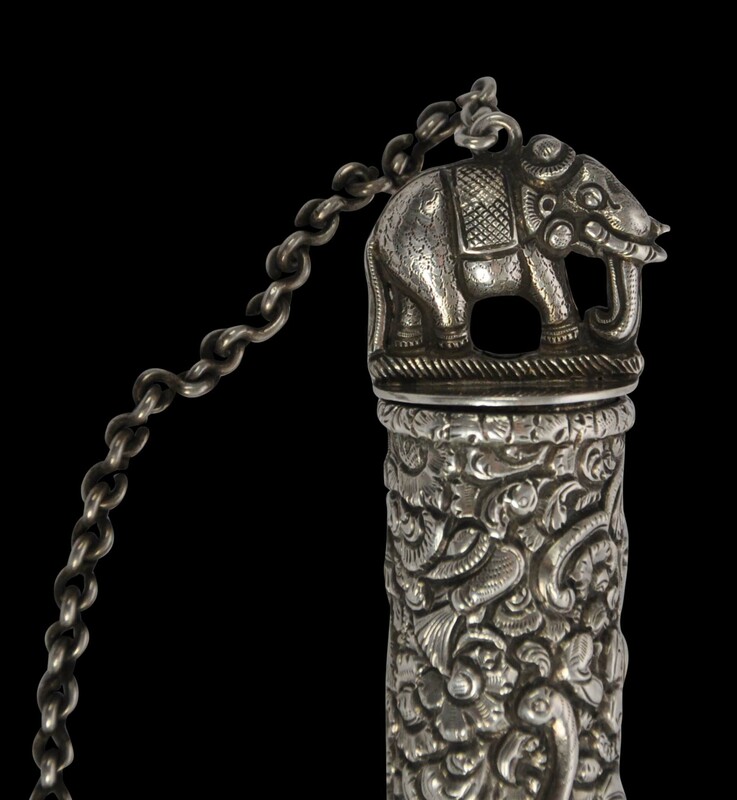 The lid has a conical silver stopper topped by a fine, caparisoned elephant that sits inside the tube. A silver chain and hook with a sharp end is suspended from the cone, and from this the thick wick would have been attached. A silver chain links the stopper with the body of the tube. Trichinpoloy (known as Tiruchirappalli today) is less than 350 kilometres from Madras, but under the British East India Company and later, British colonial administration, its silversmiths developed a unique style that incorporated the ‘swami’ style of Madras with incredibly dense and fine floral and foliage relief work. The silver and gold items produced in Trichinopoly tended to be small, luxurious items such as snuff boxes and perfume bottles. This tinder tube is well within that oeuvre. Overall, this is an excellent example of an unusual and historically interesting item. There is little polishing wear; the features remain crisp and well delineated. It is unusual that it still retains the internal chain and hook.